Chasing Rainbows A scenic Colorado country landscape summer view of a green pasture and colorful rainbow with some trees on the horizon perhaps hiding thee pot of gold. North east Boulder County. It seems to always be raining with some sunshine at the same time. 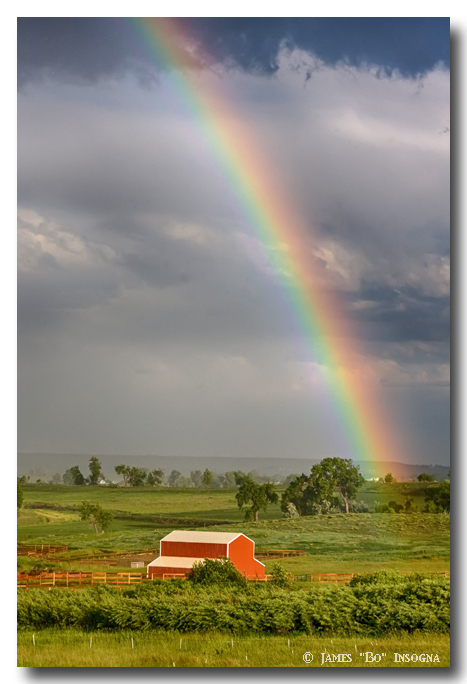 Prime time for rainbows, so when out chasing storms always chasing rainbows too, a great treat from mother nature. A rainbow can be defined as a band of colors (from red on the inside to violet on the outside) assembled as an arc that is formed by reflection and refraction (or bending) of the sun’s rays inside raindrops. They appear when it is raining in one part of the sky and sunny in another.